In what ways is the environment of your country threatened? 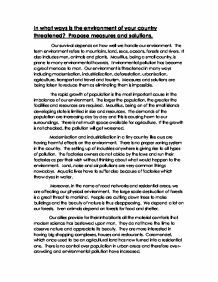 Propose measures and solutions. Our survival depends on how well we handle our environment. The term environment refers to mountains, land, seas, oceans, forests and rivers. It also includes men, animals and plants. 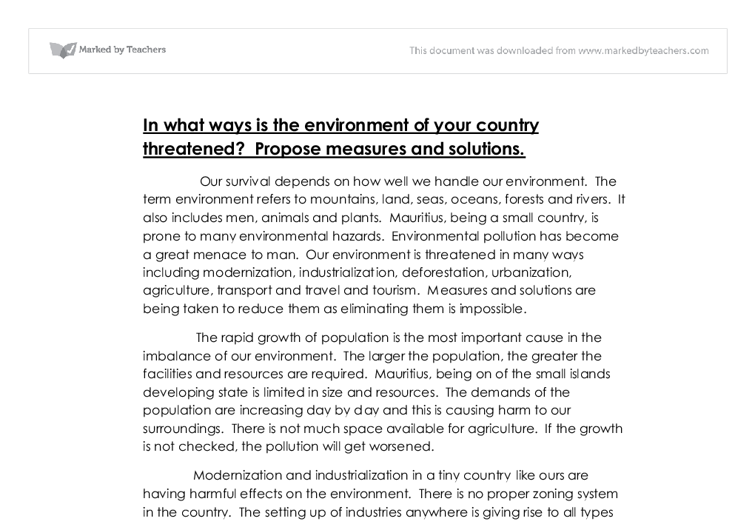 Mauritius, being a small country, is prone to many environmental hazards. Environmental pollution has become a great menace to man. Our environment is threatened in many ways including modernization, industrialization, deforestation, urbanization, agriculture, transport and travel and tourism. Measures and solutions are being taken to reduce them as eliminating them is impossible. The rapid growth of population is the most important cause in the imbalance of our environment. The larger the population, the greater the facilities and resources are required. Mauritius, being on of the small islands developing state is limited in size and resources. The demands of the population are increasing day by day and this is causing harm to our surroundings. ...read more. They do not have the time to observe nature and appreciate its beauty. They are more interested in having big shopping complexes, houses and restaurants. Coromandel, which once used to be an agricultural land has now turned into a residential one. There is no control over population in urban areas and therefore over-crowding and environmental pollution have increased. The overuse and use of chemicals in agriculture affect our land our food. The insecticides used by farmers on the plants are washed away by rain and absorbed by the soil which caused the plants to die. These chemicals have proved to be very bad for health. Pesticides also form part in killing harmful pests and harmful wild lives. Chlorinated hydrocarbons are estimated to stay in the soil that contains those chemicals can accumulate them into their tissues. Human beings, very often unaware of these facts, are victims of all types of illnesses. Atmospheric pollution is being caused by the increasing fleet of vehicles and industries. ...read more. A forestation will prove to be very beneficial. If ever we are cutting one tree, it will be good to plant another two trees. By doing this, there will be a balance in nature. The government must put a tax on fertilizers which will discourage those making excessive use of them and they will be more careful. Furthermore, catalytic converters or even unleaded petrol should be used. This will be helpful to decrease the level of pollution. Also environment education must be taught in schools. This will create awareness among the children and they will therefore know how to maintain their surroundings. Bins must be placed everywhere so as to have a clean and perfect environment. No work is done correctly without motivation. If awards for best villages, best cities and gardens are given, then the environment might become much more pleasant. Let us conclude the essay quoting the two famous sentences used by Mrs Indira Gandhi when she inaugurated the 12th World Energy Congress- "We should be good guests on earth, neither too demanding nor disturbing its delicate balance. We should allow it to renew itself for those who are to follow." ...read more. It is important to consider what the Court of Elsinore thought of Hamlet Senior, as it is supposedly their lives that he should have cared for, as his role as King also involved making decisions for dynastic reasons, to protect his Empire. "The time is out of joint; O cursed spite/That ever I was born to set it right". Hamlet's second soliloquy particularly focuses on his delay for avenging his father's death, he begins" O, what a rogue and peasant slave am I!" be like, it also implies that both victims have their own views on what their abusers were like, although it may not be the exact physical appearance, but an interpretation of evil. It also represents decay and the use of colour indicates that. A Crime In the Neighborhood.